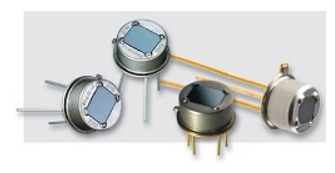 We offers a wide range of Pyroelectric Infrared Detectors in both digital and analog models. It include the complete range of DigiPyro® pyroelectric infrared detectors in TO metal housings including our dual-element models, PYD 1788 and 1798; four-element, PYQ 2898 and PYQ 5848; as well as "Smart" DigiPyro® models, PYD 1096 and PYQ 1098, with total motion electronics integration. The newly introduced SMD Pyroelectric Detectors cater to high-volume, SMT-compatible production in key motion and presence detection applications, including intrusion alarm systems and energy-saving motion-activated automatic light switches.